Not too much this week! Thanks to all who followed, liked, loved, subscribed, and gave positive comments to my comedy project's, Just Shair, launch last week! A few have been asking when the next video will be, and that answer is...in theory it was supposed to be this week as we have a few segments filmed. Unfortunately both Shannon and myself have been sick for a combined 10 days now, so the editing etc process has slowed. Within the next week or so we will have new content again, chickadees! Look out for me soon on an awesome blogger's guest post section soon! ;) Details to follow ASAP! For my first post of official spring, I figured that it couldn't be more fitting to wear one of the most spring friendly dresses that I own! This spring appropriate dress is the Bernie Dexter Serenity Bridge print in the Veronique cut. This was a lucky find over Black Friday as Unique Vintage was all sold out (after putting this dress on sale), and then one XS was magically restocked right before their BF sale was half off all sale items! Finding a Bernie dress for in the $40 range is like finding gold, y'all! This dress can be found at retail on her site here, or in a one sleeve version, skirt, or top. I've recently remembered that it's good to remind yourself, via mantras or otherwise, what you're fighting for in life or what you believe in. Life can be so messy under the best of circumstances and when things get especially busy, I find it's easy to lose sight of things and get lost in the shuffle. The first 3 months of 2016 for me has been a mix of both mundane good and bad things, with a fair amount of excitement thrown in. I'm trying to center myself currently but taking a step back mentally and remembering why I'm doing anything that I'm doing and what kind of person I believe is the best version of myself. It sounds so simple, but in the midst of chaos I can forget the bigger picture and only immerse myself in the day to day. Thought I'd share...because I figure if this can happen to me it can happen to others too! Excuse me while I Sonic Youth NERD OUT for a second. My favorite band is Sonic Youth (you may know this by now). I also follow the band's side projects, past and current. Ciccone Youth and Free Kitten probably tie for favorite Sonic Youth side project, with perhaps a lean on Free Kitten. Which brings me to the name of this blog post! 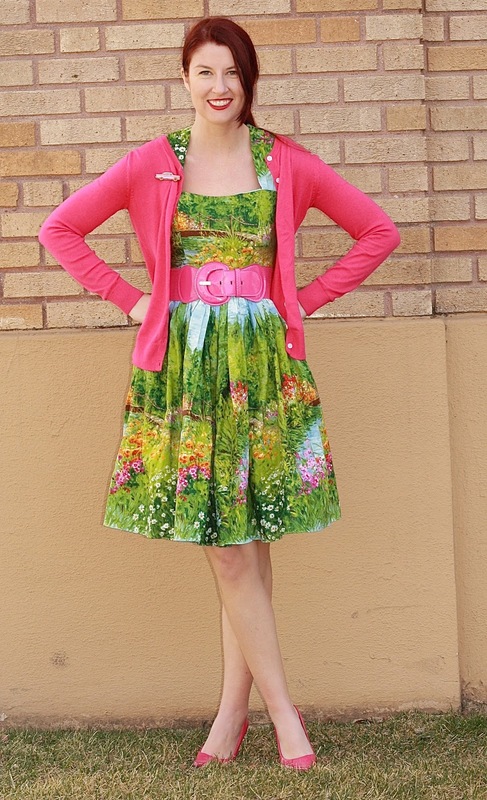 "Greener Pastures" is a Free Kitten song, and how perfect is that for a post on this green scenery dress? I've recently added two pages to this blog, one that catalogues posts named after songs and another that catalogues all of the concert stories. Click the links on to see for yourself! Happy Friday! I have that dress too but never wear it because I think it's too short for me :( Looks good on you! Oh my gosh! Thank you for writing about this dress <3! I actually went back and double-checked both of your Gaga for Bernie posts before I asked (since there's nothing worse than getting one of those 'let me Google that for you' questions! ), but thought you might've posted one in its own post at some point. I've been eyeing up the oranges print, so thanks for the review!! It's amazing that you scored this for under $40, and it fits you like a dream! I'm so excited for more Just Shair! Amazing color, love this dress, this is so beautiful! So pretty! Love the color combination! I am literally speechless! This dress is beyond stunning and the colors are so vivid! You are a breath of fresh air in it! I can't wait for another Shair video. Keep 'em coming girl! Such a gorgeous dress! You looks so pretty! Love that pink and green color combo Lauren! You look amazing! The vibrant print and colors of the dress is mesmerizing and so pretty! You look awesome! Me encanta tu estilo, y tu web. Loving this green and pink combo! Sorry you guys have both been sick. Glad you are staying positive. This dress is BEAUTIFUL!!! I love the print and the colors. So gorgeous! Very cute vibrant dress my dear. Happy Wednesday! This is such a pretty outfit, Lauren, I love green and pink paired together come spring! Glad we can be expecting new videos soon, it was so much fun watching you and Shannon, so cute and funny! I also agree with trying to look at the bigger picture in the midst of a tough situation. I believe we all have a purpose in this life and all of the experiences we face, either good or bad, are meant to make us stronger and more capable to live out that purpose. There's no way we can become successful at anything without experiencing a couple of bumps on the road. The ones that have already been paved aren't as rewarding to explore because they've already been walked on to become smooth ;) I hope you're having a great week so far, beautiful! That is such a gorgeous Spring appropriate dress! The colour is so bright and vibrant and you look amazing in the outfit. I also look forward to your next video, the first one was freaking hilarious! Love this dress on you! The print is so pretty! Congrats on finding it on such a great sale! It's a perfect dress for the change of season! Hope you feel better soon! I think that it's a good idea of check in with yourself from time to time and see if you're still on board with whatever it is you're trying to achieve. Life can definitely get messy and sometimes we just focus so much on the goal we forget why we even wanted it. This dress is amazing! It looks absolutely perfect on you!! I love me some Bernie Dexter, and agreed, finding a BD for 40 is like finding pure gold! Amazing! Such luck. this is so cute! My fave of your green dresses I've seen this month. :) See you again on my blog! Publishing a post on upcycling tomorrow! Love this style of dress on you! Beautiful pattern too! Thanks for the positivity time, has March been nuts? Great look Lauren! Love the dress on you, twinsie! The pink belt is awesome paired with it. I also have that belt, ha. This print is just so purrfect for spring, right?! I love the bold green and pink combination! You always wear green so well, I'm always so unsure what to wear it with! You look so cute and ready for spring! This outfit is super duper spring and I LOVE it! Fun dress... perfect post title! I really agree with what you said about reminding yourself of your purpose and goals... sometimes we do forget what we're looking to get out of life... and what we're willing to put in. It's refreshing to pause. and refocus... because life is chaotic! This dress is life and simply breath taking and the pink only adds more beauty! <3 <3 <3 I feel you on reminding yourself about what you're fighting for and being the best version of you, I find if things don't turn out how I want them too or if go through a bad patch it's really easy to forget all of those things... and then I'm like wait a minute rain check in need and that's also important in the good times too. The Vintage Reproduction World is on FIRE!! !